Korea Human Resource Development Institute for Health and Welfare, KOHI (President; Ryu Hoyoung) successfully concluded the ‘Maternal and Child Promotion for Latin America’ Program. 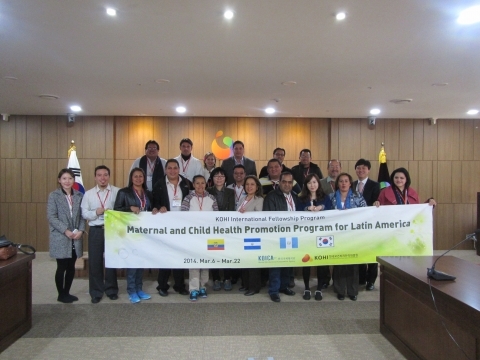 CHEONGWON--(Korea Newswire) March 21, 2014 -- Korea Human Resource Development Institute for Health and Welfare, KOHI (President; Ryu Hoyoung) successfully concluded the <Maternal and Child Promotion for Latin America> Program. Health officials and professionals from Eucador, El Salvador, and Guatemala participated in the course from 6th March to 22th March in 2014. The program is one of KOICA multi-years fellowship programs and aims to train the health workforce for maternal and child health promotion sustainably until 2014. In this year as last year program, it included workshops to review the past 2years of this MCH program specifically for the action plans(of the 2nd year’s fellowship program) and validate the possible barriers and their overcoming strategies as well as invitation training. The course was designed to focus on maternal and child health. Lecturers from Ministry of Health & Welfare, Ministry of Education, and Kangnam Severance Hospital delivered. Participants also visited Girls' Middle School affiliated with Seoul National University, MizMedi Hospital, Government Complex Sejong, and EBS to see and learn the programs and projects for maternal and child health promotion in Korea.